The KleenWater brand KWHW2510 is made in Italy of reinforced polyamide. It is rated for maximum temperature or 176 degrees F. The inlet / outlet is 3/4" FPT. A pressure relief valve allows easy cartridge change. The kit is provides tremendous convenience and facilitates a quick and easy installation. 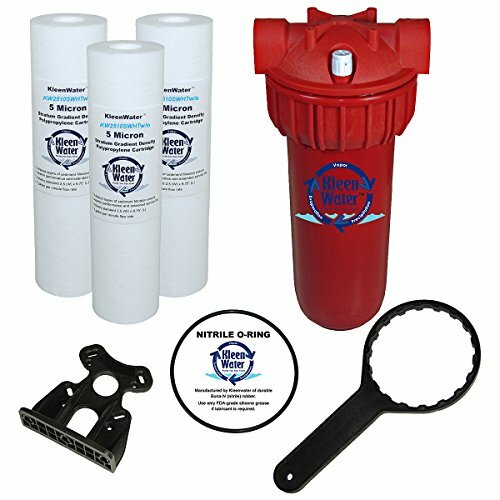 The water filter dimensions are approximately 5"(W) X 12"(L) and accept industry standard 2.5"(W) X 9.75"(L) cartridges. Our KW2510SWHT cartridge is constructed of 100% polypropylene filtration material. The cartridge is rated for 5 micron dirt/rust/sediment filtration and rated for 176 degrees Fahrenheit. The flow rate is up to 7 gallons per minute. Please enter model KW2510SWHT-without-siliphosQty3 in the Amazon search bar to re-order high temperature sediment cartridges.